"Japanese legend" redirects here. For the Japanese pantheon, see List of Japanese deities. For Japanese urban legends, see Japanese urban legends. Japanese myths, as generally recognized in the mainstream today, are based on the Kojiki, the Nihon Shoki, and some complementary books. The Kojiki, or "Record of Ancient Matters", is the oldest surviving account of Japan's myths, legends and history. The Shintōshū describes the origins of Japanese deities from a Buddhist perspective, while the Hotsuma Tsutae records a substantially different version of the mythology. One notable feature of Japanese mythology is its explanation of the origin of the Imperial Family, which has been used historically to assign godhood to the imperial line. The title of the Emperor of Japan, tennō (天皇), means "heavenly sovereign". In the Japanese creation myth, the first deities which came into existence, appearing at the time of the creation of the universe, are collectively called Kotoamatsukami. Later, the seven generations of kami, known as Kamiyonanayo ("Seven Generations of the Age of the Gods"), emerged, following the formation of heaven and earth. The first two generations are individual deities called hitorigami, while the five that followed came into being as male/female pairs of kami: brothers and sisters that were also married couples. In this chronicle, the Kamiyonanayo comprise 12 deities in total. In contrast, the Nihon Shoki states that the Kamiyonanayo group was the first to appear after the creation of the universe, as opposed to the Kamiyonanayo appearing after the formation of heaven and earth. It also states that the first three generations of deities are hitorigami (individual deities) and that the later generations of deities are pairs of the opposite gender, as compared to the Kojiki's two generations of hitorigami. Japan's creation narrative can be divided into the birth of the deities (Kamiumi) and the birth of the land (Kuniumi). The seventh and last generation of Kamiyonanayo were Izanagi no Mikoto ("Exalted Male") and Izanami no Mikoto ("Exalted Female"), and they would be responsible for the creation of the Japanese archipelago and would engender other deities. The parents, who were dismayed at their misfortune, put the children into a boat and sent them to sea, and then petitioned the other gods for an answer about what they had done wrong. They were informed that Izanami's lack of manners was the reason for the defective births: a woman should never speak prior to a man; the male deity should have spoken first in greeting during the ceremony. So Izanagi and Izanami went around the pillar again, and this time, when they met, Izanagi spoke first. Their next union was successful. Note that Hokkaidō, Chishima and Okinawa were not part of Japan in ancient times. Izanami died giving birth to Kagutsuchi (incarnation of fire), also called Homusubi (causer of fire) due to severe burns. She was then buried on Mount Hiba, at the border of the old provinces of Izumo and Hoki, near modern-day Yasugi of Shimane Prefecture. In anger, Izanagi killed Kagutsuchi. His death also created dozens of deities. Izanagi lamented the death of Izanami and undertook a journey to Yomi ("the shadowy land of the dead"). Izanagi found little difference between Yomi and the land above, except for the eternal darkness. However, this suffocating darkness was enough to make him ache for light and life. Quickly, he searched for Izanami and found her. At first, Izanagi could not see her for she was well hidden in the shadows. Nevertheless, he asked her to return with him. Izanami spat at Izanagi and informed him that he was too late. She had already eaten the food of the underworld and now belonged to the land of the dead. Izanagi was shocked at this news, but he refused to give in to her wishes to be left to the dark embrace of Yomi. Izanami agreed to return to the world but first requested to have some time to rest. She instructed Izanagi to not come into her bedroom. After a long wait, Izanami did not come out of her bedroom, and Izanagi was worried. While Izanami was sleeping, he took the comb that bound his long hair and set it alight as a torch. Under the sudden burst of light, he saw the horrid form of the once beautiful and graceful Izanami. The flesh of her ravaged body was rotting and was overrun with maggots and foul creatures. Crying out loud, Izanagi could no longer control his fear and started to run, intending to return to the living and to abandon his death-ridden wife. Izanami woke up shrieking and indignant and chased after him. Izanami instructed the shikome, or foul women, hunt for the frightened Izanagi and to bring him back. Izanagi, thinking quickly, hurled his headdress, which became a bunch of black grapes. The shikome fell on these but continued pursuit. Next, Izanagi threw his comb, which became a clump of bamboo shoots. Now it was Yomi's creatures that began to give chase, but Izanagi urinated against a tree and created a great river that increased his lead. Unfortunately, the shikome still pursued Izanagi, who began to hurl peaches at them. He knew that this would not delay them for long, but he was nearly free, for the boundary of Yomi was now close at hand. Izanagi burst through the entrance and quickly pushed a boulder to the entrance of Yomi. Izanami screamed from behind this barricade and told Izanagi that, if he left her, she would destroy 1,000 living people every day. He furiously replied that he would give life to 1,500. And so began the existence of Death, caused by the hands of the proud Izanagi, and his abandoned wife Izanami. Susanoo (incarnation of storms) from his nose. Izanagi went on to divide the world between them with Amaterasu inheriting the heavens, Tsukuyomi taking control of the night and moon and the storm god Susanoo owning the seas. In some versions of the myth, Susanoo rules not only the seas but also all elements of a storm, including snow and hail, and, in rare cases, even sand. Amaterasu, the powerful sun goddess of Japan, is the most well-known deity of Japanese mythology. Her feuding with Susanoo, her uncontrollable brother, however, is equally infamous and appears in several tales. One story tells about Susanoo's wicked behavior toward Izanagi, who, tired of Susanoo's repeated complaints, banishes him to Yomi. Susanoo grudgingly acquiesces, but has first to attend some unfinished business. He goes to Takamagahara ("heaven") to bid farewell to his sister, Amaterasu. Amaterasu knows that her unpredictable brother does not have good intentions and is prepared for battle. "For what purpose do you come here?" asks Amaterasu. "To say farewell," answers Susanoo. But she does not believe him and requests a contest for proof of his good faith. A challenge is set as to who can bring forth more noble and divine children. Amaterasu creates three women from Susanoo's sword, while Susanoo makes five men from Amaterasu's ornament chain. Amaterasu claims the title to the five are attributed to Susanoo. Both gods declare themselves to be victorious. Amaterasu's insistence in her claim drives Susanoo to violent campaigns that reach their climax when he hurls a half-flayed pony (an animal sacred to Amaterasu) into Amaterasu's weaving hall and causes the death of one of her attendants. Amaterasu, angered by the display, hides in the cave called Iwayado. As the sun goddess disappears into the cave, darkness covers the world. All of the gods and goddesses strive to coax Amaterasu out of the cave, but she ignores them all. Finally, the kami of merriment, Ame-no-Uzume, hatches a plan. She places a large bronze mirror on a tree, facing Amaterasu's cave. Then, Uzume clothes herself in flowers and leaves, overturns a washtub and begins to dance upon it, drumming the tub with her feet. Finally, Uzume sheds the leaves and flowers and dances naked. All of the male gods roar with laughter, and Amaterasu becomes curious. When she peeks outside, a ray of light called "dawn" escapes and Amaterasu is dazzled by the beautiful goddess that she sees, this being her own reflection in the mirror. The god, Ameno-Tajikarawo, pulls her from the cave, which is sealed with a shimenawa. Surrounded by merriment, Amaterasu's depression disappears, and she agrees to return with her light. Uzume is then known as the kami of dawn as well as of mirth. Susanoo, exiled from heaven, comes to Izumo Province (now part of Shimane Prefecture). It is not long before he meets an old man and an old woman sobbing beside their daughter. The old couple explain that they originally had eight daughters who were devoured, one after the other, by the dragon, Yamata no Orochi ("eight-forked serpent", who is said to originate from Koshi—now Hokuriku region). The terrible dragon had eight heads and eight tails, stretched over eight hills, and is said to have eyes as red as good wine. Kushinada-hime ("rice paddy princess") was the last of the eight daughters. Susanoo, who knew about the old couple's relation to Amaterasu, offers his assistance in return for their beautiful daughter's hand in marriage. The parents accept, and Susanoo transforms Kushinada into a comb and hides her safely in his hair. He also orders a large fence-like barrier to be built around the house. The fence has eight gates, with eight tables placed at each gate and eight casks placed on each table. Each cask is filled with eight-times-brewed rice wine. Orochi arrives and finds his path blocked. After boasting about his prowess, he finds that he cannot get through the barrier. His keen sense of smell takes in the sake—which Orochi loves—and the eight heads are now faced with a problem. They want to drink the delicious sake, yet the fence blocks access to the sake. One head suggests that they simply smash the barrier, but that would knock over the sake. Another proposed that they combine their fiery breath and burn the fence to ash, but then the sake would evaporate. The heads begin to search for an opening. They find the hatches, and, eager for the sake, they wish to poke their heads through to drink it. Yet, the eighth head, which is the wisest, warns his brethren about the folly of such an act and volunteers to go through first to ensure that all is well. Susanoo waits for his chance. He allows the head to drink some sake in safety and to report to the others that there is no danger. All eight heads plunge through the hatches and greedily drink every drop of the sake. As the heads finish, Susanoo launches his attack on Orochi. Drunken from drinking so much sake, the great serpent is no match for the spry Susanoo who decapitates and slays Orochi. A nearby river is said to have turned red with the blood of the defeated serpent. As Susanoo cuts the dragon into pieces, he finds an excellent sword from a tail of the dragon that his sword had been unable to cut. The sword is later presented to Amaterasu and named Ama no Murakumo no Tsurugi (天叢雲剣, "Sword of the Gathering Clouds of Heaven", which was later called Kusanagi, "Grass Cutter"). This sword was to feature prominently in many other tales. Mostly known by his nickname Ōkuninushi, Ōnamuji was a descendant of Susanoo, and represented the power structure localized in the Izumo area. Ōkuninushi's people succeeded in unifying territory to some measure, but later relinquished control to the Yamato-based clans, as described in the Tenson kōrin chapter, below. A tale of how the merciful Ōkuninushi helped the beleaguered rabbit or hare is of enduring fame, and often told as a sort of a Mukashibanashi or "once upon a time tale". It is found in Kojiki but not recorded in the "Nihongi". Ōkuninushi (at the time he was just Ōnamuji without the august nickname) had eighty brothers who were rival suitors courting Princess Yakami/Yagami (八上比売) of Inaba to become her husband. They started out of their homeland of Izumo headed for the neighboring province, with Okuninushi brought along to follow and carry the luggage of his more eminent brothers. The brothers encountered a rabbit who had been flayed (by crocodile-fish, usually interpreted as sharks) and lay in agony upon a sea shore. In a wicked-hearted gesture, they advised the rabbit to bathe in the briny sea and blow himself dry in the wind. The rabbit found himself in worse agony. Ōnamuji, who came lagging behind, took pity on the creature and told the hare to wash in fresh water, then roll in the scattered fleece of cattail plants. The cured rabbit made a divined prediction that Ōnamuji would be the one to win Princess Yakami, "though thou bearest the bag,"
As the hare predicted, Princess Yakami pronounces her choice of Ōnamuji for husband before the eighty gods, and they all conspire and kill him twice over. His mother petitions Kamimusubi [ja], one of the creator deities, and resuscitates him each time, finally sending him off to seek Susanoo who has been banished to the Netherworld (Ne-no-kuni), and to obtain his wise counsel. Here Ōnamuji meets face to face with Susanoo's daughter Suseri-hime and they immediately marry. The crafty Susanoo tests Ōnamuji several times, but, in the end, Susanoo approves of the young boy and foretells Ōnamuji's victory over his brothers. Although the Yamato tradition attributes the creation of the Japanese islands to Izanagi and Izanami, the Izumo tradition claims that Ōnamuji, along with a dwarf god called Sukunabiko, contribute to, or at least finish, the creation of the Japanese islands. In the Nihongi here begins the section entitled "Age of the Gods: Part II" (kamiyo ge-kan (神代下巻)). The episode of the Tenson kōrin (天孫降臨, "Descent of the Heavenly Grandson") begins with description of how the heavenly gods (Ama-tsu-kami) who dwelled in the Heavenly Plains (Takama-ga-hara) peered down upon the earth below (known by the stilted name Ashihara no Nakatsukuni (葦原中国, "Reedy Plains Middle World"). It represents Japan, not the whole world), and dispatched various members of their own kind to subjugate it. Amaterasu had decreed her own grandson Ninigi to rule over the terrestrial world, but the terrestrial gods (kuni-tsu-kami) were not altogether willing to hand it over, and odd sorts of terrestrial gods were still lurking about making it too dangerous. Some of the gods first appointed to quell the middle world were derelict in their mission, or joined leagues with the terrestrial gods. After several false starts, two gods were finally successful. They were Ame-no-ohabari [ja] (aka Itsu-no-ohabari; elsewhere this kami is said to be a sword) and Takemikazuchi. They embarked aboard the Ame-no-torifune [ja] or "Deity Heavenly-Bird-Boat" to their military campaign. These two sabre-rattling deities were able to frighten Ōkuninushi's two sons into flight, causing Ōkuninushi to abdicate and relinquish the territories to the Heavenly Grandson. the sword Kusanagi (now in the Atsuta Shrine in Nagoya). The mirror was to be worshipped as a representation of Amaterasu. A number of deities were made to make the descent at this time. Ninigi and his company went down to the earth and came to Himuka (Hyūga province, today's Miyazaki prefecture), there he founded his palace. Ninigi met Konohanasakuya-hime (symbol of flowers), the daughter of Yamatsumi (master of mountains), and they fell in love. Ninigi asked Yamatsumi for his daughter's hand. The father was delighted and offered both of his daughters, Iwanaga (symbol of rocks) and Sakuya (symbol of flowers). However, Ninigi married only Sakuya and refused Iwanaga. "Iwanaga is blessed with eternity and Sakuya with prosperity", Yamatsumi said in regret, "by refusing Iwanaga, your life will be brief from now on". Consequently, Ninigi and his descendants became mortal. Sakuya conceived by a night and Ninigi doubted her. To prove legitimacy of her children, Sakuya swore by her luck and took a chance; she set fire to her room when she had given birth to her three babies. By this, Ninigi knew her chastity. The names of the children were Hoderi, Hosuseri and Howori. Ninigi's elder son Hoderi or "Fire-Shine" had the gift of the bounty of the sea, and gained his livelihood by fishing (and bore the nickname Umisachihiko or "Luck of the Sea"). 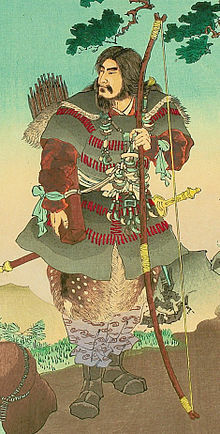 The younger son Hoori or "Fire-Fade" had the gift of the bounty of the mountains, and was a hunter (and nicknamed Yamasachihiko or "Luck of the Mountains"). One day, Luck of the Mountains asked his elder brother Luck of the Sea to exchange their tools and swap places for a day. He wanted to try his bid at fishing. But he did not catch a single fish, and worse, he lost his borrowed fishhook. To make amends, he shattered the very sword he was wearing to make a hundred, then a thousand hooks to replace what he lost, but the elder brother would accept nothing but the original fishhook. Luck of the Mountains was sitting on a beach balefully weeping, there came to his aid Shiotsuchi-no-oji ["Tide-way god"] (one of the deities now enshrined at Shiogama Jinja). The tide god built him a small ship described as being manashikatsuma (无間勝間, 間なし勝間, "basket without interstices"), and sent him on a journey to the fish-scaled palace of the Watatsumi (Sea God, often conceived of as a dragon-god). There he had a fateful meeting with the Sea God's daughter Princess Toyotama, and married her. After three years, he remembered his brother and his fishhook, and was longing to return home. Watatsumi gathered his piscean minions, and soon the fishhook was found in the throat of a bream (tai) and restored to Luck of the Mountains. The Sea God also imparted two magical balls: Shihomitsutama (塩盈珠, "Tide-flowing ball") which could cause a flood, and Shihohirutama (塩乾珠, "Tide-ebbing ball") which could cause water to recede and dry up. And he gave additional strategic advice to gain advantage from his contentious elder brother. So riding on a fathom-long crocodile-fish or shark (hitohiro-wani (一尋鰐)), they returned to dry land. The pregnant Princess Toyotama built a cormorant feather-thatched maternity house and pleaded her husband for privacy, as she would be reverting to her true shape while delivering her child. But Howori (Luck of the Mountains) was overcome with curiosity, and peeped inside to discover her transformed into a crawling 8-fathom "croc-fish" (shark, dragon), and scuttered away in fright. Ashamed and disgusted by her husband's breach of trust, she abandoned the newborn and returned to sea. The infant prince was named Ugaya meaning "cormorant house". Ugaya married his aunt, the sea princess Tamayori and had five children, including Iwarebiko, who was later to become Emperor Jimmu. In the Nihongi, the "Age of the Gods" (kamiyo (神代)) section ends here, and is followed by sections under the titles of the reigns of each Emperor. The first legendary Emperor of Japan, best known by his posthumous name of Emperor Jimmu was referred to in the records by the title of Iwarebiko (神倭伊波礼琵古命/神日本磐余彦尊, Kamu-yamato Iware-biko no-mikoto). He is the son of Ugaya, descendent of Ninigi, and the sea princess Tamayori. His given name was Hiko-hohodemi. His ascension marked the "Transition from Age of the Gods to Human Age". With claimed descendent from sun-goddess Amaterasu through Ninigi, Emperor Jimmu launched an expedition to capture Yamato. After taking control of Yamato province, he established the imperial throne and acceded in the year of kanototori (conventionally dated to 660 B.C.). His pedigree is summarized as follows. Oshihomimi is born from an ornament of Amaterasu. Ninigi is a son of Oshihomimi and Akizushi. The descendants of Ninigi, including Jimmu, were rooted in Himuka Myth Road of the Hyūga province (today Takachiho, Miyazaki Prefecture). After Jimmu's death, an elder prince named Tagishishimi [ja] (who was not first in line as successor) moved to consolidate power under him while everyone else was in mourning, and plotted to slay his two younger half-brothers. The plot was suppressed, and the younger prince who had the courage to pluck the bow and shoot Tagishishimi fatally was cede the crown to become the next emperor, Suizei. Of the eight emperors who succeeded Jimmu, there is very little record of their deeds, so they are described collectively under Book III of Nihon Shoki. Regarding Emperor Suizei, the foregoing description of how he suppressed his elder brother's insurrection. And for the other legendary rulers, not much more than their genealogy is given. The 10th Emperor Sujin is discussed in the Nihon Shoki. Nihon shoki (Suinin 28; 2 B.C.) states that when his uncle died, all his closer retainers were buried around in perimeter around the kofun tumulus, but their wailings could be heard for days. (Note: the word junshi (殉死) also includes such deaths compelled upon retainers. cf. similar forced sacrificial burials were evidenced from Shang Dynasty grave sites in China.) This emperor allegedly decided this practice was cruel and must cease; and, four years later, he adopted the idea forwarded by Nomi no Sukune to bury clay figurines called haniwa instead of live men. The Kojiki reports that during the reign of the 11th emperor Suinin, a man named Tajimamori was sent to Tokoyo-no-kuni (常世の国, "Eternal Land") in a quest for the tokijiku-no-kaku-no-konomi (時じくの香の木の実, 登岐士玖能迦玖能木実, "fruit of the everlasting fragrant tree"). He was able to gather eight vine-like trees and eight spear-like trees. But by the time he returned, the Emperor was dead. The Kojiki identifies the fruit as the tachibana, a type of small, sour citrus. Tajimamori has later been hailed as the Kami of wagashi (Japanese confection and sweets), revered at Nakashima Shrine [ja] in Toyooka, Hyōgo, though this is little known trivia to the average Japanese. The Nihon shoki dates Tajimamori's travel to Suinin 90 (purportedly 61 A.D.), and makes him out to be the great-grandson of Amenohiboko, a Korean prince who came to Japan just two years earlier. However this is anachronistic according to Kojiki, which places Amenohiboko in a much later era. Much of the book of the 12th Emperor Keikō is taken up by the heroic deeds of his prince, Yamato Takeru. See List of legendary creatures from Japan for a broad spectrum of creatures potentially classifiable as being "mythological creatures". Yōkai or animals that interact with humans in Japanese folklore are discussed in those pages. Yamata no Orochi, the eight-headed serpent, discussed above. The rabbit aided by Ōkuninushi, and the wani (crocodile, modern scholars assume it to be a type of shark) that flayed it. Kinshi [ja], blindingly bright golden kite that aided Jimmu; it may be a double of the crow. Watatsumi, sea god, often called Ryūjin or Dragon God. Shinigami, a Japanese god of death. Many deities appear in Japanese mythology, and many of them have multiple aliases. Furthermore, some of their names are comparatively long. This article therefore lists only the most prominent names, and gives them in one of their abbreviated forms, other abbreviated forms are also in use. In some parts of this article, proper names are written in a historical manner. In this article, underlined h, y, and w denote silent letters; they are omitted from modern spelling. Other syllables are modernized as follows (see also Japanese romanization systems). Note that some blend of these conventions is also often used. zi and di are modernized as ji (the distinction disappeared). For instance, various spellings of Ohonamuji include Oonamuji, Ohnamuji, and others. Aston, William George (1896). Nihongi: Chronicles of Japan from the Earliest Times to A.D. 697. 1. London: Japan Society. Ujiya, Tsutomu (宇治谷孟) (1988). Nihon Shoki (日本書紀). 上. Kodansha. ISBN 978-0-8021-5058-5. Modern Japanese translation. ^ A Brief History Of The Immortals Of Non-Hindu Civilizations. Aryavart Sanatan Vahini 'Dharmraj'. p. 21. ISBN 9781329586079. ^ Yang, Jeff, Dina Gan and Terry Hong. Eastern Standard Time. p. 222. Metro East Publications, 1997. ^ "Japanese creation myth". Public wsu. Retrieved 20 January 2016. ^ Kelsey, W. Michael (1983). "Untitled", Asian Folklore Studies Vol 42, No 1, p. 142–3. ^ Littleton, C. Scott, (May 1983). "Some Possible Arthurian Themes in Japanese Mythology and Folklore", Journal of Folklore Research. Vol 20, No 1, p.67–81. ^ Fairchild, William (1965). "Mika: Jar Deities in Japanese Mythology", Asian Folklore Studies. Vol. 24, No 1, p. 81–101. ^ Littleton, 1983, p. 72. ^ Chamberlain 1919, p.120, " Herb-Quelling-Great-Sword", etc. ^ Keene, Donald (1955). Anthology of Japanese Literature. Grove Press. ISBN 4-06-158833-8. , p.54, citing Kojiki XXXIX-XLII. ^ Takeda 1977, Kojiki, p.71,255; Nihongi (Ujiya 1988) does not mention the animal as sending him back, but involves the 1-hiro croc and 8-hiro croc-fish when he initially reached the Sea God's realm. Aston 1896's Englished Nihongi either emended the passage to conform with Kojiki or followed a different manuscript. ^ Fairchild, 1965, p. 94. ^ Metevelis, Peter (1983). A Reference Guide to the Nihonshoki Myths, Asian Folklore Studies. Vol 52, No 2, p. 383–8. ^ Chamberlain 1919, Sect. LXXIV, p.245- ""